Windows 10 Sticky Notes offer a quick and easy way for jotting down some quick text you need to remember. Apart from note taking, this app can help you sending your emails. Let’s learn the trick to send Email using Sticky Notes in Windows 10. It’s simple! In the empty field of Windows 10 Search bar, type Stick Notes and select it. You will notice that Sticky Notes now is not a Desktop app, but in Windows 10 it is a Trusted Windows Store app. If you have Notes pinned to your taskbar, simply click the Sticky Notes icon to open it. Click on the 3 dots visible in the extreme right-hand corner of your computer screen and then, select the ‘Settings’ icon. Next, you will see a box titled Settings. 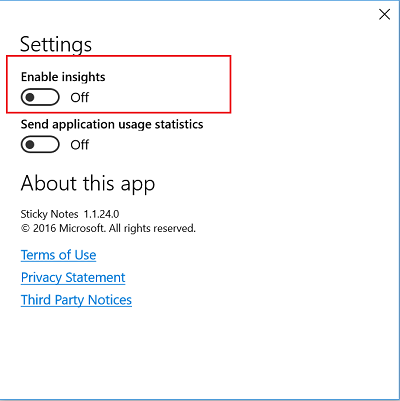 Toggle the Enable insights switch to the On position to allow Sticky Notes to connect to Bing and Cortana. When connected, you will be allowed perform a few enhancements. Currently, the ‘Enable Insights’ setting is available for US users only, but it expected to be rolled out to all soon. If you stay in other countries and want to use this feature, you will have to change the Language and Region settings to USA. Now on the Sticky Note, enter an email address. The color of the address will be changed to dark blue indicating the attachment of a hyperlink. Place the mouse cursor anywhere near the email address and a Send Email button should immediately visible to you. Click on it. Now, a box will open asking you – How do you want to open this? 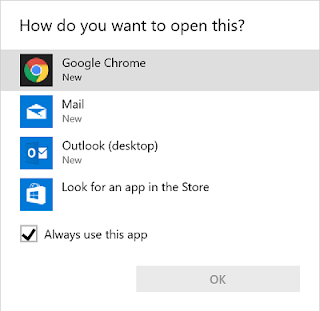 Select the Mail app (Or Outlook) and check the ‘Always use this app’ option. Depending on the programs you have installed on your system, Sticky Notes display multiple apps or browser to send the email, like Mail app, Google Chrome, Opera etc. When done, hit the OK button. A new email form will open up. Write your message and hit the ‘Send’ button. 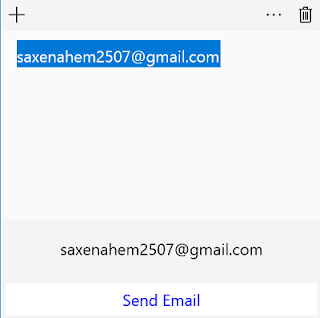 Now, whenever you click on the Send Email button on a Sticky Note, the Mail app will be launched and you will notice ‘Compose’ flashing on your computer screen, alongside the email id of the recipient displayed in the ‘To‘ field.